relationships mean the systems we install meet real community needs, stay up and running over the long-term, and deliver maximum impact to the beneficiaries. We also provide opportunities for individuals and teams to travel and work with us, gaining a first-hand view of our work in action while providing funds to support our projects. This April, GRID Alternatives will travel to the remote island of San Fernando with local Nicaraguan participants to install solar home systems on ten local families' homes. The solar home systems will allow families to light their home with clean, renewable electricity for the first time, replacing the use of hazardous kerosene lanterns and candles. This project is being installed by GRID staff and local Nicaraguan participants. In late April, 10 employees from IGS with travel to Mexico with GRID Alternatives to install a 27 kW grid-tied solar system on La Hacienda orphanage in Tijuana. With solar, the orphanage is anticipated to save up to $500 per month on their electricity bill, funds they can instead put towards unlocking opportunities for the children that live there. Mexican students studying renewable energy at the Universidad Tecnlogica de Tijuana will also join IGS and GRID in the installation for a hands-on training experience in solar. This project is sponsored by IGS Energy, and is part of a multi-year philanthropic partnership with GRID Alternatives. Participation is not open to the public. This November, travel with GRID to Nicaragua to support women by bringing a solar-powered coffee grinder and roaster to a women's agricultural cooperative in El Regadio. With the ability to roast and grind their coffee beans locally with the power of the sun, the women's cooperative will be able to offer higher value coffee products in the market, and generate additional income to support the community and their families. Learn more about the project and how you can sign up. This past March, GRID Alternatives traveled to the department of Jinotega, Nicaragua, to install 15 solar home systems and nine improved cookstoves for families in the community of El Regadio. This was GRID's third project in El Regadio, after bringing solar to the local school and installing the community's first 20 solar home systems in 2017. Local Nicaraguan participants joined GRID for the installation to gain a hands-on training experience in solar, installing all the off-grid systems and improved cookstoves from start to finish over the four days of the project. Learn more and see photos from the project. During the first week of March, a team of 11 students from University of Michigan traveled with GRID to Nepal's Chitwan National Park to bring solar power to the Kumal Tower as part of GRID’s first International Solar Spring Break! With access to clean, reliable electricity, the Kumal Tower will be transformed into an ecotourism stay for visitors, creating employment opportunities and generating income to bolster conservation efforts and livelihoods in the local community. See photos from UMich's trip and installation! In late February, GRID's Nicaragua staff installed a solar-powered drip irrigation system on the family farm of Andres and Mayra Chavarria, in the rural community of Colón, Jinotega, in north central Nicaragua. The system brings clean energy and greater economic opportunities to the Chavarria family, in addition to greater food production and availability for the community of Colón. Learn more about the project and see photos from the installation. In February of 2019, 11 RES employees joined GRID in Nepal's Bardia National Park to install solar on the Green Tower, an observation tower and ecotourism accommodation located in the Bathanpur Community Forest of the Bathanpur Bufferzone. Managed by the User Committee of the Bathanpur Community Forest, the Green Tower is expected to see a significant increase in the number of overnight guests now that it has access to reliable electricity, creating employment opportunities and generating additional income to bolster conservation efforts and livelihoods in the local community. See photos from the installation with RES. This February, GRID installed a solar-powered grain mill with the Karnali Sports Club (KSC) in Jumla, in western Nepal. The grain-mill will generate revenue to aid KSC in supporting their 22 female and 16 male youth athletes, and surrounding communities now have a nearby grain-mill, saving families time and money. The project provided a unique, hands-on solar training opportunity for KSC youth athletes and a second training opportunity for Nepali women who participated in GRID's first Women in Solar project in December 2018. This project was made possible with generous support from BayWa r.e. Learn more and see photos from the installation. In January 2019, a group of 10 Nicaraguan women traveled to El Platanal, Boaco to install 15 solar home systems and 11 improved cookstoves, as part of GRID's 5th Annual Women in Solar project! The Women in Solar program gives local women the opportunity to get hands-on experience in solar and encourages women to join the predominately male-dominated industry. The installed solar home systems will provide basic lighting and energy needs for families who previously did not have access to conventional electricity, and the improved cookstoves will provide families a clean and more efficient wood-burning stove. See photos from the installation. This December 15-17, 10 Nepali participants traveled to Chitwan National Park to install a 2kW off-grid solar system on the Kaathe Observation Tower for the launch of GRID’s first “Women in Solar” project in Nepal! The installation provided a unique, hands-on training experience for participants that exposed them to work in renewable energy and demonstrated to participating women that they too have the potential and opportunity to be a part of the growing solar industry in Nepal. Now successfully installed, the access to reliable electricity will also help the local community generate additional income to support conservation and livelihood efforts in Chitwan National Park. This project was sponsored by Empowered by Light with support from Friends of Nepal and Creating Possibilities. Learn more and check out photos of the installation. At the beginning of December 2018, ten employees from Trojan Battery Company traveled with GRID Alternatives' International Program to Baja California, Mexico to bring off-grid solar to the local school in the Kumeyaay community of Juntas de Neji. With the installation of a solar PV system, the facility now has electricity for the first time, and will be able to power lighting, fans, as well as electronic educational materials that expand the school's access to resources and enhance the overall learning environment for the students. This project is the second phase of GRID's effort to bring solar electricity to Juntas de Neji in 2018, and followed the installation of 18 solar home systems that were installed in November. Both phases of the project used Trojan batteries to store electricity generated by the solar panels. Learn more and see photos from the installation. Three months after a severe landslide cut through Chatang in mid-September 2018, community members have safely returned to live in their village, and GRID partner Gham Power, has now successfully completed the installation of a community micro-grid. Chatang is located in the Nuwakot District of central Nepal, and despite neighboring the capital district of Kathmandu, the region is not as developed and lacks essential infrastructure, like access to the electric grid. The remote community is at least 3 hours walking from the nearest road and current sources of energy for lighting and cooking include flashlights and kerosene oil lamps, which are expensive and unreliable. A micro-grid is a better option to power the community, and will provide energy for basic needs and essential infrastructure, such as lighting, communication, healthcare, and local revenue generation. This project was made possible with the generous support of Northland Control Systems, Inc. See photos from the installation and learn more about the project. On November 16, local Nicaraguan participants traveled with GRID Alternatives' to the rural community of San Isidro, to install 17 battery-based solar home systems and bring clean lighting and AC power to community households. There are 300 residents in San Isidro with no access to conventional grid electricity. The community is located where two municipalities converge, which means San Isidro is not always recognized and is often left out of the allocation of resources for basic services. Solar is a solution that provides high quality lighting for night-time studying and activities at home, while enabling families to use regular home appliances like lamps, cell phones, RVs, computers, fans, and more. Learn more and see photos from the installation. Located in the municipality of Tecate, Juntas de Neji is the northernmost indigenous community in Baja California, México that sprawls across 11,590 hectares of land. Although Juntas de Neji is relatively close to larger towns like Tecate and Tijuana, grid electricity has never been extended to the community. This past November, with support from Flex Foundation, GRID staff installed 18 Solar Home Systems alongside Flex employees and renewable energy students from the Universidad Tecnologica de Tijuana, bringing clean, renewable energy to families in Juntas de Neji for the very first time. Learn more. In early October 2018, Northland Controls employees worked alongside GRID staff and GRID partner Gham Power to install a 1.8kW solar photovoltaic (PV) system on the Shree Dumre Secondary School, located in Palungtar municipality of the Gorkha District, a region of Nepal severely affected by the devasting earthquake of 2015. The school currently holds classes for around 120 students from Grades 1 to 8. Most of the students come from the remote villages of Dumre Dada, Jaljale, Pathivara and Patchang and have to walk on an average of one and a half hours to reach school each day. Now with access to clean, reliable electricity, the school will be able to power computers, printers, and internet, that will enhance the quality of education for the students of the Shree Dumre School. Learn more. At the beginning of September 2018, eight employees from IGS Energy traveled with GRID Alternatives' International Program to Door of Faith orphanage, working alongside renewable energy students from Universidad Tecnologica de Tijuana to install a 30kW grid-tied photovoltaic (PV) system. The system will significantly reducing energy bills and directly increasing their savings capacity so the orphanage can continue to serve children and families from nearby communities in need. Learn more. In August 2018, ten employees from IGS Energy traveled with GRID Alternatives' International Program to Casa de la Esperanza orphanage in Tijuana, Mexico, to install a 15kW grid-tied photovoltaic (PV) system alongside four reneweable energy students from nearby Universidad Tecnologica de Tijuana. Harnessing the power of the sun, the orphanage will now be able to generate their own clean energy, significantly reducing their electric bill, and directly increasing their savings capacity. Casa de la Esperanza orphanage is part of a network of private orphanages in Mexico supported by GRID's non-profit partner Corazón de Vida. This was GRID's second PV system installation on an orphanage within this network. Learn more. In April, GRID Alternatives participants traveled to Nepal to install a 1.2 kW solar system to provide clean, reliable electricity to an off-grid wildlife observation tower in Chitwan National Park. Chitwan is Nepal’s first National Park, a refuge to the Bengal Tiger and home to one of the last populations of single-horned Asiatic rhinoceros, among many other species. Electricity transforms the tower into a safe space for travelers to view the wildlife the park protects and stay overnight for a fee. The income that this eco-tourism operation generates is managed by local residents that are dedicated to wildlife and resource conservation, habitat restoration, women's empowerment initiatives, and education programs. Learn more. In April 2018, GRID Alternatives participants traveled to Nicaragua to install solar home systems and improved cookstoves for 11 households in Platanal, Nicaragua while learning about household energy matters in rural communities. The solar home systems displace harmful kerosene lamps and provide each household with light and AC power outlets so families can use regular home appliances like lamps, cell phones, TVs, computers, and fans. The culturally appropriate improved cookstoves are more efficient and require less wood than cooking over open flames, which means fewer emissions, healthier air, and saving women time. Both solar and improved cookstoves directly impact the health and well-being of Nicaraguan families. Learn more. In February 2018, GRID Alternatives’ International Program participants worked with Maria Luisa and Freddy Cruz, who are small-scale farmers in the community of La Rinconada, Jinotega, Nicaragua, to install a solar-powered drip irrigation system on their land. The system reduces the family's production costs, increases the diversity and volume of the crops they can gro year-round, reduces pollution, and increases their income. Learn more. In January 2018, GRID Alternatives hosted our 4th annual Mujeres del Sol project, which offers a unique opportunity for Nicaraguan women interested in joining the renewable energy industry to participate in a project to gain hands-on experience installing solar. 10 women volunteers from Nicaragua joined us for the installation of a solar-powered potable water pumping system in the rural community of San Isidro, where most people make their living through small-scale agriculture. In Nicaragua, although there are several universities with renewable energy programs, opportunities to actually participate in a hands-on installation are scarce. The annual Mujeres del Sol project is a part of GRID's Women in Solar initiative across the whole organization with the goal of bringing more women into the solar industry. Learn more. In many rural Nicaraguan homes, the kitchen is a place where families are exposed to harmful smoke from cooking over open flames. In November 2017, travelers joined us in the community of El Pedregal, Nicaragua to install 17 improved cookstoves to replace open-fire stoves in homes that already have GRID solar home systems. A culturally appropriate cookstove design was chosen to respect families' cooking traditions while improving efficiency, saving families time, and improving air quality. Learn more. In November 2017, GRID travelers installed a 1.2 kW off-grid solar system in Nepal's Chitwan National Park. The solar system powers the Dulekhola Tower, one of 11 observation towers located throughout the "buffer zone," a mile-wide area along the circumference of the national park that is a delicate balance of jungle and human settlement. Electricity transforms the tower into a safe space for travelers to view wildlife and stay overnight for a fee. The income from thetowers is managed by local residents that are dedicated to wildlife and resource conservation, habitat restoration, women's empowerment initiatives, and education programs. Learn more. In October, GRID's International Program and GRID San Diego completed our first project in Mexico -- a 10 kW solar system on the Casa Hogar Ebenezer orphanage with support from our partners Corazón de Vida and Get Charged Up. Home to 35 children ages 3-18 years, the orphanage provides safe accommodations and stability for displaced children in Tijuana. The new solar system will save the orphanage hundreds of dollars each month. Residents of the home and 23 students from the Universidad Autónoma de Baja California in Tijuana studying engineering and renewable energy joined us for this hands-on project to learn about solar and gain skills to enter the growing renewable energy industry in Mexico. Learn more. The community of El Regadio lies in the north central region of Jinotega in Nicaragua. Jinotega is known for its cool climate, its mountainous terrain, and its ideal conditions for growing coffee. Most people make their living growing crops and raising cattle. Many families use kerosene or diesel lamps in their homes to see at night, even if they are aware that they are at risk for respiratory illnesses, because it is the least expensive option. In October 2017, GRID Alternatives participants worked alongside residents to install solar home systems that provide 20 households with light and AC power outlets so families can use regular home appliances like lamps, cell phones, TVs, computers, and fans. Learn more. In August 2017, ten employees from IGS Energy traveled with GRID Alternatives' International Program to the community of San Isidro, Jinotega, Nicaragua. Together, we worked alongside community members to install 18 battery-based solar home systems so families now have access to light and AC power in their households. Like many communities that do not have access to the electrical grid, residents previously relied on non-renewable energy sources that are expensive and hazardous to use. Solar is a solution that provides high quality lighting for night-time studying and activities at home, while enabling families to use regular home appliances like lamps, cell phones, RVs, computers, fans, and more. We are grateful that IGS joined us all the way from Ohio to make this project possible! Click here to see photos from this project. Ten international participants traveled to the community of El Regadio in San Sebastián de Yalí, Nicaragua in July to work alongside community members on the installation of an off-grid solar system on the local school. The system provides lights and AC power to support and improve the quality of communication, education, and recreation for students and community members. Electricity at the school enables the teachers and residents to charge their cell phones and plug in small appliances. Classes can be offered in the evenings at a convenient time for working adults and the teachers will be able to plan their lessons at night without having to commute into town to use electricity. We were connected to El Regadio through a GRID client in the Bay Area from Nicaragua whose family members live in the community! Click here to see photos from this project. In May 2017, 10 employees from Trojan Battery Company traveled to Nicaragua to immerse in the community of San Isidro and work alongside residents to install solar PV systems on their local school and health clinic. Since GRID began working in Nicaragua over 9 years ago, all of our off-grid systems in Nicaraguan communities have utilized Trojan batteries for energy storage. During the sponsored project, Trojan employees had the opportunity to get hands-on with their batteries see their company's products being used to impact people firsthand. Click here to see photos from this project and read about one employee's powerful experience here. In May 2017, a group of GRID Alternatives travelers worked alongside Jimling community members and Nepali solar company Gham Power to install a 3.78 kW solar-powered grain mill system. In this remote community in Nepal's Chitwan district, community members are subsistence farmers and agroprocessing is critical to daily life. Having access to the grain mill will improve local agroprocessing by allowing community members to process higher volumes of grains with greater efficiency and convenience. The mill will benefit approximately 100 households in Jimling and surrounding communities. Additionally, the project provides opportunity for the family who operates the mill from their existing small business and will support the entire community through income being generated and circulated locally. Click here to see photos from this project. In March 2017, travelers took a week-long journey with GRID Alternatives to transform the rural community of Potrero Sur, Nicaragua with the power of solar in their homes. Previously, many families used kerosene or diesel lamps to see at night, despite their awareness of the risks of respiratory illnesses, because these were the only options accessible to them. For basic lighting, some families had two D alkaline batteries with wires connected to a tiny light bulb from a flashlight. These lighting solutions were expensive and hazardous to use and did not provide the quality of lights families desired. The new solar home systems now provide 15 families with light and AC power outlets so they can use regular home appliances like lamps, cell phones, TVs, computers, and fans. Click here to see photos from this project. 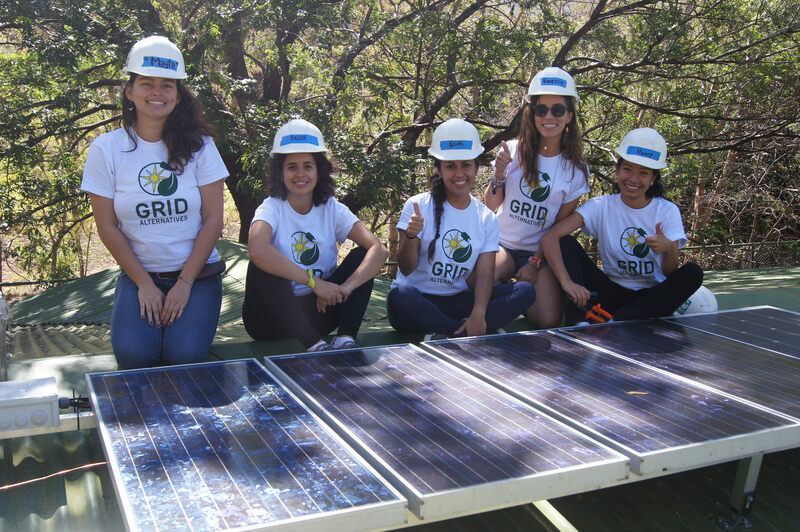 Each year, GRID offers a unique opportunity for Nicaraguan women who are interested in the renewable energy industry to gain hands-on solar installation experience by participating in our annual "Mujeres del Sol" project. In January 2017, 10 women installed a 1 kW off-grid PV system on the primary school and the health clinic in the rural community of Los Encuentros, Estelí. While a few renewable energy programs are offered by universities in Nicaragua, opportunities to get actual installation experience are very scarce. The "Mujeres del Sol" initiative gives Nicaraguan citizens a chance to learn about solar, gain skills to enter the growing renewable energy industry, and to have a role in creating a clean energy future for their country. Click here to see photos from this project. In the rural community of El Pedregal, Nicaragua, families are living in extreme poverty. With the nearest town a 2 hour walk away, it is difficult for people to get even the most basic necessities. Nearly 7 years ago, GRID worked with the community to install solar on their local school. In November 2016, GRID returned to El Pedregal to install solar home systems, providing a brighter path for current and future generations. In October 2016, GRID Alternatives’ International Program volunteers worked with farmers Silverio Rizo and Anita del Carmen Matus Marea to install a solar-powered drip irrigation system on their small farm in the community of Jucuapa Abajo, Matagalpa, Nicaragua. The system makes it possible for the Rizo family to irrigate their crops all year round, improving crop volume and diversity and providing additional income for their family of 12. One year after the devastating earthquakes, Nepali people are still working to move from rubble to reconstruction, and from darkness to light. In the wake of the disaster, GRID Alternatives installed a solar microgrid to bring power to one of the most deeply impacted communities in Nepal: the village of Dhapchung. Thanks to the hard work of our volunteers and partners and the generosity of our supporters, the Dhapchung community now has an unprecedented level of connectivity and opportunity. GRID Alternatives International Program volunteers traveled with GRID in July to install a solar-powered drip irrigation system on a small farm in Jinotega, Nicaragua. The solar-powered irrigation system will enable the Cruz family to dramatically improve their crop productivity and diversity, spend less time collecting water, and increase their income, transforming their agricultural livelihood and leaving a lasting impact on the family. In June 2016, GRID Alternatives’ International Program volunteers installed a solar-powered drip irrigation system on the small farm of Juan Pablo Herrera and Maria Helena Molina in Jinotega, Nicaragua. Volunteers installed a solar-powered water pump that moves water from a water source into a tank, and then gravity moves the water through the tubes to the plants drip by drip. In May 2016, GRID Alternatives’ International Program volunteers installed a solar-powered drip irrigation system on a small farm in Matagalpa, Nicaragua. The system includes a solar-powered water pump that moves water from a water source into a tank, and then gravity moves the water through the tubes to the plants drip by drip. In March 2016, GRID Alternatives volunteers installed a 1kW off-grid battery-based solar electric (PV) system on an elementary school in San Juan de Paula, Boaco, Nicaragua. Volunteers had the opportunity to stay with families from the community for three days during the solar installation. Before and after the solar project, the group traveled around country to learn more about Nicaraguan geography, people and culture. In January 2015, GRID Alternatives led a group of Nicaraguan women volunteers to install a battery-based PV system on the community school in El Guaylo. One year later, in January 2016, GRID led another all-women volunteer team to install a battery-based solar PV system on the health clinic. Impacts from El Guaylo's solar-powered school and health clinic include access to technology in schools, entrepreneurship opportunities, better medical care, and savings of time and money. Read more about the background and impacts of these projects in the El Gualyo Case Study. In November 2015, GRID Alternatives’ International Program volunteers installed a solar-powered drip irrigation system on a small farm in Matagalpa, Nicaragua. The project uses solar power to pump water from a water source into a tank, and then gravity moves the water from the tank into tubes that water the farmer’s crops through drip irrigation. In November 2015, GRID Alternatives led a team of volunteers to Nicaragua to install an off-grid PV system on a health clinic in the town of Agua Fria, Esteli. Volunteers worked in two groups to install the battery-based systems that brought lights and AC power to the rural health post called a “casa base”. The health post is used every week by the community to treat a range of injuries and illnesses since the closest hospital takes hours to walk to from each community. A volunteer health worker is on call at the health post and several times a year the post is used by health brigades that bring vaccines and other medical services to the community. In October 2015, GRID Alternatives led a private trip to Nicaragua with volunteers from SunEdison to install an off-grid photovoltaic system on a primary school in the community of Sector 2, located at San Fernando Island in Solentiname. Join us on a trip to install an off-grid photovoltaic system on a primary school in the community of Totumblita. Totumblita is tucked behind a forgotten corner of the town of Ciudad Dario, Matagalpa, Nicaragua, down an unimproved road that is impassible during the rainy season. GRID volunteers will install a PV system that will provide lights for the school and AC power, allowing the school to serve as a central charging place for cell phones and other appliances that improve the quality of life in this impoverished farming community. Los Chaquites is a rural community that has never had electricy. Residents are still seeing by candlelight and kerosene lamps - which are costly and dangerous for indoor use. Travel with us to install solar on the school, providing a safe place for community members to meet and learn after dark, as well as charge phones. In April 2015, GRID Alternatives led a trip to Nicaragua with volunteers to install an off-grid photovoltaic system on a primary school in the community of Agua Fria. Agua Fria is a small town located in the department of Esteli, Nicaragua. The community is made up of 159 people living in 30 houses and is 6km from the electric grid. There is a public bus that visits the community twice a week when the road is passable in the dry season. In March 2015, GRID Alternatives led a private group of 40 volunteers to Nicaragua to install off-grid solar home systems in the community of Potrero del Platanal, Boaco, Nicaragua. This community has no access to conventional grid electricity and is one of the most remote towns in this region, tucked away within the mountainous landscape of San Lorenzo, Boaco. The 235W systems use high-quality components and are designed to meet the needs of the rural families, bringing lights and AC power their homes. GRID Alternatives installed an off-grid PV system on the school in Platanal in 2013. In December 2014, GRID Alternatives’ International Program launched a pilot project to improve the lives of small farmers in rural Nicaragua. GRID Alternatives volunteers worked with local families and partners, Suni Solar S.A. and the National Union of Growers and Livestock Farmers (UNAG), to install a solar-powered drip irrigation system to provide water to fruits and vegetable crops for small family-run farms. The system will pump water from a nearby water source, store the water in a tank, and then use gravity to provide water to the crops, providing a reliable low-water irrigation method for the farmer’s fruit and vegetable crops during the dry season. Click here to learn more about this project. Volunteers helped install two off-grid photovoltaic systems in La Trinidad, a rural community in the department of Boaco, one on a small health post and the other on the primary school. Volunteers also got to stay at a sustainable coffee farm in Matagalpa and see the colonial town of Granada. Click here to view photos from the trip, or here for more information about the project, click here. Volunteers installed a 1.38kW off-grid photovoltaic system on a primary school in the community of Los Encuentros, a rural community located in a very remote part of Matagalpa, Nicaragua that is only accessible by footpath. The school serves 81 children and serves as a community hub. After the installation, volunteers visited Granada and saw the annual festival of its patron saint, Virgen de la Asunción, where processions filled the street with colorful flowers, decorations and fireworks. August 15th was also the “hipico,” a parade of horses with cowboys dressed to impress. For more information about this project, click here. May 2014, GRID Alternatives led a team of SolarCity employee volunteers to Nicaragua through SolarCity’s Give Power Foundation to install a 1.38kW off-grid photovoltaic system on a primary school in the community of El Islote. The small fishing village of El Islote (“The Islet” in Spanish) is located in the municipality of Buenos Aires, Rivas, Nicaragua, about 58 miles south of the country’s capital of Managua. The community sits on the edge of a freshwater peninsula in Lake Nicaragua, the largest lake in Central America. Click here to see photos. For information on sponsored trips, contact Maura McKnight, mmcknight@gridalternatives.org or 510-731-1321. In March 2014, GRID Alternatives led a trip to Nicaragua to install a 1.38kW off-grid photovoltaic system on a primary school in the rural community of Charco Muerto. This community sits on a white sandy beach on the edge of Lake Nicaragua and is perched on the southeast end of volcano Mombacho. Volunteers also had the chance to see the town of Masaya celebrate the festival of San Lázaro in honor of the patron saint and protector of animals. Click here to view photos from the trip. On February 1 2014, GRID Alternatives and Power to the People led a trip to Nicaragua with volunteers from Sunrun to install a 1.38kW off-grid photovoltaic system on a primary school in the community of Potrero Sur. Potrero Sur is a rural community located in Boaco, Nicaragua (90 kilometers northeast of the country’s capital, Managua). Volunteers stayed at a sustainable coffee farm in Matagalpa and visited the historic town of Leon to learn more about Nicaragua before and after the solar installation. Click here to view photos from the trip. GRID Alternatives acquired Power to the People in 2014. Click here to read about past projects through Power to the People.